Each kind of tree is a sort of musical instrument. Put your ear close to the whispering branch & you may catch what it’s saying. The same is true for animals, every animal has its story, thought, daydream & interest. Humankind’s greatest priority is to reintegrate with the natural world. Located in the junction of the Aravalli & Vindhya Hill Range, Ranthambore National Park and resorts in the premises are the best & the easiest way to access the priority. Ranthambore National Park in Sawai Madhopur District of Rajasthan State is the finest place to stand & stare the beauty of nature. Flora, fauna & the royal remains of the majestic fort make this a leading Wildlife Reserve stand out in the country. Ranthambore National Park is famous as secure habitat for tigers & many other wild species. To witness & narrate the bountiful history of this royal state and to behold distinct wild life, accommodations are vouchsafed by the resort Mount Valley near the Ranthambore National Park. The Resort is the best Place to stay in Ranthambore National Park. To figure worth,the resort is pre-eminent,undoubtedly. A refreshing weather, green surroundings and well-preserved building makes it the exemplary resort near Ranthambore National Park. This Ranthambore National Park Resort is a perfect get-away location where you gain complacent leisure. The Ranthambore National Park resort, Mount Valley has a quintessential itinerary. Ranthambore fort, “The World Heritage” lies within the domain. It exhibits the impeccable laudation of the Chauhan Dynasty. The fort serves venturesome venue. During 1950’s it became a part of the ‘Sawai Madhopur Game Sanctuary’ to sustain the waning wild life. 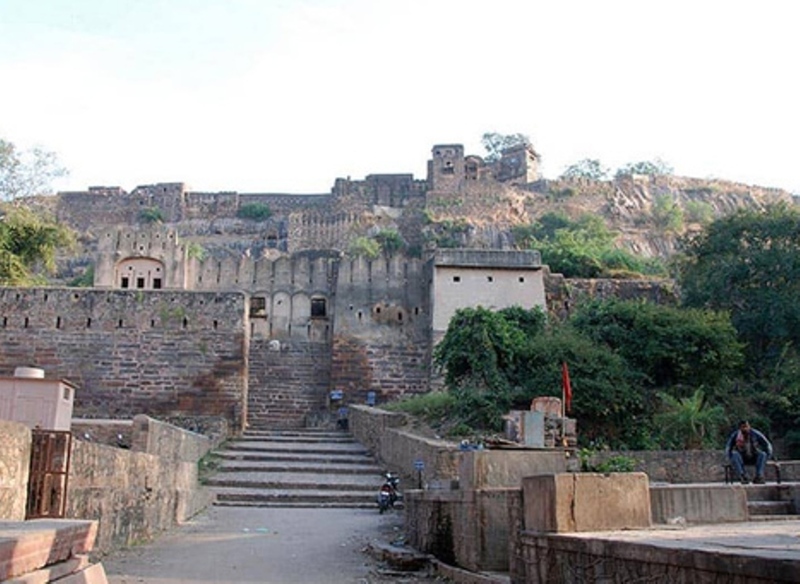 The mighty fort of Ranthambore has seen an immense number of attacks & conquests. Mount Valley, the best resort in Ranthambore, assists its viewers in illustrating a well-planned construction of the fort that protected it from many invaders. For the God lovers, Mount Valley Resort near Ranthambore National Park also acts as a shrine, as the Three-Eyed Ganesha Temple in Ranthambore fort, which is comprised of Bappa’s whole family is an easy access from the resort. It’s about 12 kms from Sawai Madhopur & is ensconced in Ranthambore Fort of Rajasthan state. According to the history, In 1922, a war took place between King Hammir & Abdul Khilji at the Ranthambore fortification. During the war,one night the passionate follower, King Hammir dreamt that Lord Ganesha, blessed him by saying that all the lackings and problems would be vanished the following day. Next morning, an idol of Lord Ganesha with three-eyes stamped from one of the wall of the fort. A miracle happened, the war got over & treasure was filled again.In 1300 AD,the ardent King Hammir Chauhan built the temple.For years, the Hindus from all over the world come to the temple to worship the deity of fortune & wealth. Ranthambore National Park resort, The Mount Valley helps in casting an expedition more beautiful and scenic as the view of ‘Padam Talao’ the largest lake is an another halt inside the park embedded with the splendour of Jogi Mahal. The lake was named after the floating lilies. Visitors can also visit banyan location, considered to be the largest “banyan tree” in India. The ravishing sight of umpteen birds is eye-catching. Although smaller, nestled amidst the enormous forest, Malik Talao is a haven for migratory birds & crocodiles. If luck favours, your vision can spot the wild animals quenching thirst. Raj Bhagh Talao is the most attractive lake within Ranthambore National Park. It’s a tiger descrying area. Also, Sambhar Deer is a regular visitor as it has a wide range of water resources & forest zone. Keeping the safety foremost, Mount Valley the Resort near Ranthambore National Park facilitate their sightseers by bestowing Jeep Safari. It is a desirable way to explore wildlife, especially for photographers. Along with open grasslands, remains of monuments etc. It extends a partial daredevil moment. You’ll have a chance of previewing Sambhar deer, Blue Bull, Langur, Sloth Bear, leopard & Tigers. Glance of many different birds is an icing on the cake. The safari can be relished either early morning or at noon. Following the extremity of protection, inside the Ranthambore wildlife reserve vehicles have to follow a fixed route. Also known as ‘Tiger Valley’, Kachida Valley has treasure of various plants, endangered animals, birds & insects. The hilly terrain renders an extreme adventure. It’s the fourth regional museum that plays vital role in spreading awareness about the significance of preserving flora & fauna. It’s nothing less than a storehouse that hoards geology of the western part of India with a blend of our planet’s diversity. At last but not the least, Mount Valley Resort is the best place to stay in Ranthambore National Park.To relish many more riches & charisma of related whereabouts the Mount Valley Ranthambore National Park Resort not only proffers self-contained abode but also, confers a remarkable sense of timelessness in the lap of Mother Nature, dotted with remains of fort & audacious takeovers of animal kingdom.